Flame and Fortune in the American West creatively and meticulously investigates the ongoing politics, folly, and avarice shaping the production of increasingly widespread yet dangerous suburban and exurban landscapes. The 1991 Oakland Hills Tunnel Fire is used as a starting point to better understand these complex social-environmental processes. The Tunnel Fire is the most destructive fire—in terms of structures lost—in California history. More than 3,000 residential structures burned and 25 lives were lost. Although this fire occurred in Oakland and Berkeley, others like it sear through landscapes in California and the American West that have experienced urban growth and development within areas historically prone to fire. Simon skillfully blends techniques from environmental history, political ecology, and science studies to closely examine the Tunnel Fire within a broader historical and spatial context of regional economic development and natural-resource management, such as the widespread planting of eucalyptus trees as an exotic lure for homeowners and the creation of hillside neighborhoods for tax revenue—decisions that produced communities with increased vulnerability to fire. Simon demonstrates how in Oakland a drive for affluence led to a state of vulnerability for rich and poor alike that has only been exacerbated by the rebuilding of neighborhoods after the fire. 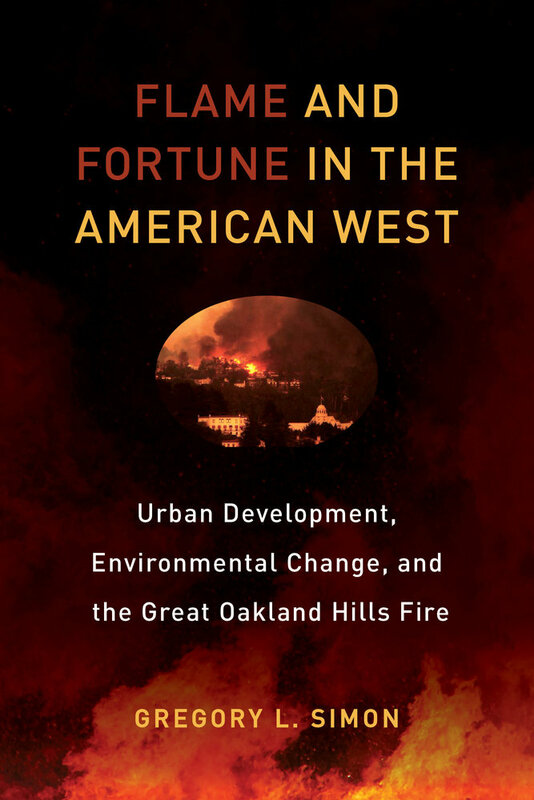 Despite these troubling trends, Flame and Fortune in the American West illustrates how many popular and scientific debates on fire limit the scope and efficacy of policy responses. 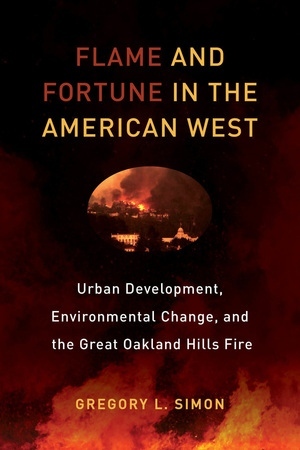 These risky yet profitable developments (what the author refers to as the Incendiary), as well as proposed strategies for challenging them, are discussed in the context of urbanizing areas around the American West and hold global applicability within hazard-prone areas. Gregory L. Simon is Associate Professor of Geography and Environmental Sciences at the University of Colorado Denver and coeditor of Cities, Nature, and Development: The Politics and Production of Urban Vulnerabilities. He has been a core advisor to the United Nations Foundation and is a National Science Foundation grant award winner. He has recently served as a visiting scholar at the University of California, Los Angeles, and at Stanford University.